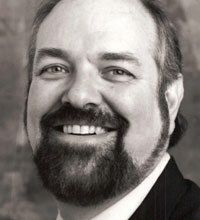 American bass James Moellenhoff began his career singing with opera companies across his homeland. Hailed for his sonorous voice and dignified stage presence in roles such as “Gurnemanz” (Parsifal), “König Marke” (Tristan und Isolde), “Boris Godunov”, “Zacharias” (Nabucco) and “Sarastro” (Die Zauberflöte), he is equally well known for his comedic gifts in roles such as “Osmin” (Die Entführung aus dem Serail), “Kezal” (Die Verkaufte Braut) and “John Falstaff” (Die Lustige Weiber von Windsor). After numerous engagements across the United States and Canada, Mr. Moellenhoff made his European debut in Germany in 1990. Since that time, he has appeared in opera houses in Bremen, Karlsruhe, Mannheim, Hannover, Frankfurt, Cologne, Stuttgart, and Berlin, as well as in Bern and Salzburg. His extensive repertoire includes, in addition to those roles already mentioned, “Rocco” (Fidelio), “Sparafucile” (Rigoletto), Händels’ ”Saul”, “Silva” (Ernani), “il Grande Inquisitore” (Don Carlo), as well as his celebrated performances of the Wagnerian repertoire, in which he has embodied “Gurnemanz” (Parsifal), “Pogner” (Die Meistersinger von Nürnberg), “Hunding” (Die Walküre), “Hagen” (Götterdämmerung), “Landgraf” (Tannhäuser), and “König Marke” (Tristan und Isolde). James Moellenhoff’s musical versatility is evident in his varied concert repertoire, which includes, among others, Haydn’s Creation, Händel’s Messiah, Rossini’s Stabat Mater, Beethoven’s Missa Solemnis, the “Matthäuspassion” of Bach and the Requiems of Mozart and Verdi. Mr. Moellenhoff received his first musical training in voice and trumpet in his hometown of St. Louis, Missouri. He later completed a Bachelor of Music degree at Southwest Missouri State University before earning his Master of Music at the University of Texas at Austin. He currently resides in Leipzig, Germany, where he is a member of the ensemble at the opera. Among recent and upcoming engagements we find König Marke in Tristan und Isolde in concert with the Montreal Symphony Orchestra under Kent Nagano, Hagen in Götterdämmerung at the Royal Opera in Stockholm as well as for The Royal Opera House Covent Garden and Fafner in Siegfried for De Vlaamse Opera.